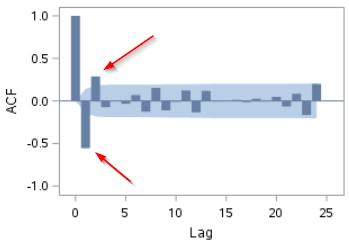 Differencing can often be used to stabilize the mean of a time series. ​Let's look at an example below. 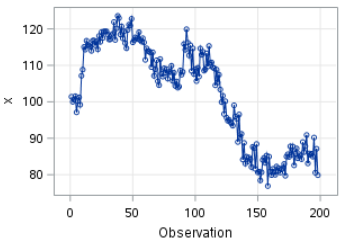 Let's again look at the time series profile using the ARIMA procedure. 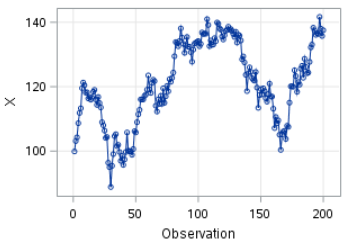 The time series plot clearly shows an upward and downward trend. 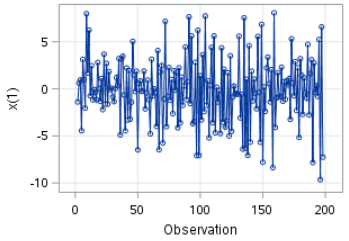 One way to stationarize a time series is to do what we called differencing. Differencing is subtraction of the variable X by its own lagged value. The DIF function in this example computes the difference between X and its own lagged value. For example, X2 (i.e. X at time 2) is 103.13 and X1 is 99.89. 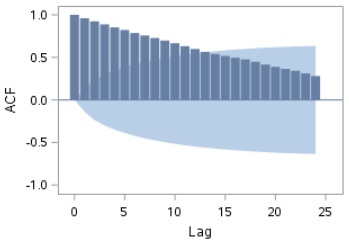 Differencing helps stabilize the mean of the time series. 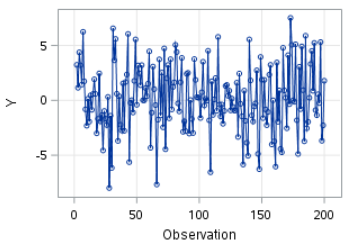 ​The time series plot for Y shows a constant mean. 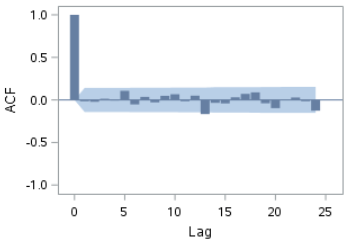 ​The ACF plot shows a sharp drop at lag 1. Nice! We have successfully transformed a non-stationary time series into a stationary time series. Note: in this example, we have manually computed Y, which is the difference between X and its own lagged value. Differencing can be done in the ARIMA procedure. We specified one in a bracket after the variable X (i.e. x(1)). 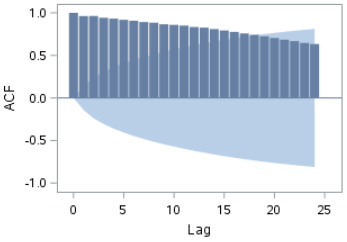 This tells SAS to perform one order of differencing. The ARIMA procedure above will generate the exact same result as we had before (without manually computing Y). 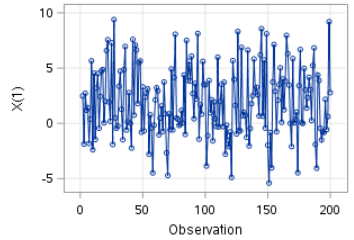 The time series plot shows a constant increase of X over time. 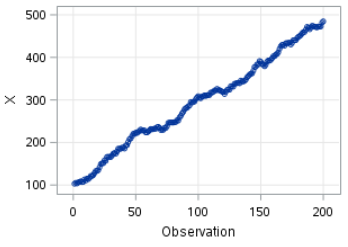 There is a clear upward trend that makes the series non-stationary. Again, we are going to stabilize the mean by one order of differencing. Differencing does not always stationarize a series completely. The EX4 data set also contains a list of simulated values. The movement of X is quite irregular. It stays above 100 in the earlier part of the series before going below 100 in the later part of the plot. The ACF also shows a slow decline to zero. This is another trait that shows the series is not stationary. The mean of the series is stabilized. Overall, there is a huge improvement on stabilizing the mean of the series. The spikes on the ACF plots will be modeled using additional parameters in the ARIMA model. ​This will be discussed in the next few sections. Is the time series stationary? 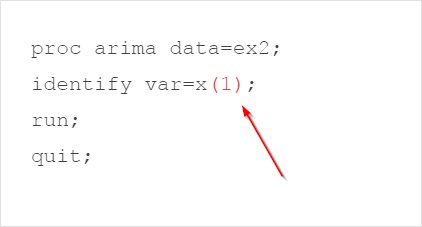 Perform a one-order differencing if the series is not stationary. Do you see any improvement?